"오랜 경험을 바탕으로 최상의 제품으로 고객 만족을 꾸준히 실천하겠습니다." chain shackle and their fittings. Since 1991, our highly qualified products range has been continuously extended to fulfill our valuable customer's requirements. 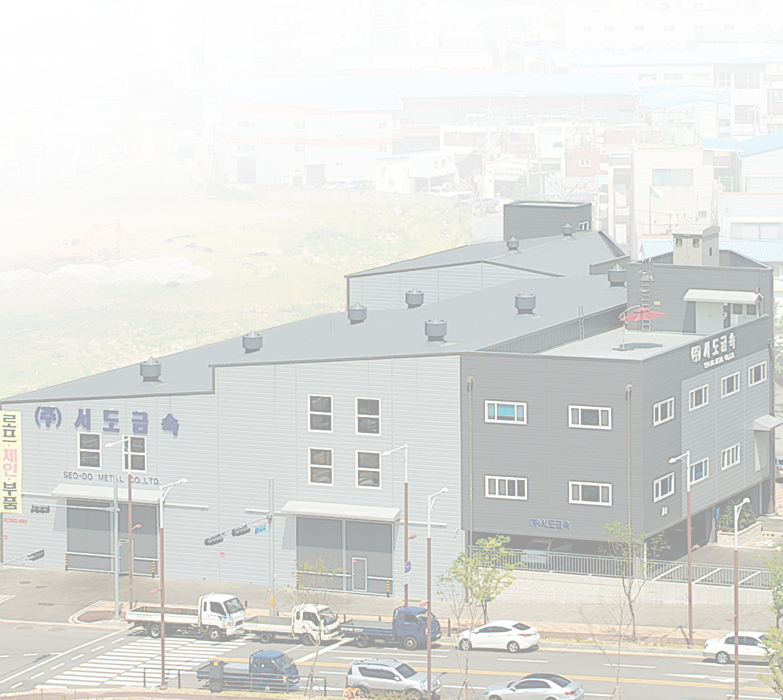 We are located in GUNPO, south direction and near from Seoul, the center of logistics in Korea. More than 2,200 pallets plus same volume of bundle stocks are available from our warehouse. All items in our warehouse are supplied by top qualified manufacturer world widely including made in Korea. Not only standard product, but also the special products are available made by specialist for each product based on your requirement. Our slogan is "Seo-Do" the one stop qualified products' shop. This means we serve you from our stock with a complete products line of rope, chain and lifting device at once with the quickest correspondence. Even for non-stock items or order base items, we are ready for quick delivery. We are the best partner for your rigging business in Korea. We are looking forward your inquiry and mutual successful business near future. (주)서도금속에서 취급하는 로프 체인 및 관련부품에 대해 소개합니다. 1991년 이래로 서도는 계속해서 더 좋은 제품으로 고객사의 믿음에 보답코져 노력해오고 있습니다. 전 세계에서 가장 우수한 품질의 제품을 적기에 국내에 공급하기 위해서 당사 창고에 다량의 재고를 보유하고 있습니다. 기성품뿐만 아니라 주문제작 또한 각 제품별 전문가에 의해 제작, 공급하고 있습니다. 당사의 바람은 "서도" 하면 "원스톱 고품질 샵"으로 인식되는 것입니다. 즉, 당사에서 취급하고 있는 고품질의 로프, 체인, 부속품 등 관련된 모든 제품들을 재고로 충분히 확보하여 적기에 공급을 하고, 재고가 없더라도 가장 빠르게 공급 하자라는 것입니다. 당사가 재고로 두는 제품은 세계적으로 품질을 인정받아 세계 곳곳에서 널리 쓰이고 있는 가장 유명한 브랜드의 제품입니다. 당사는 물론 각각의 제품들은 ISO 9001, ISO 14001과 DNV, ABS, EN, DIN 등의 규정에 맞춰 제작된 제품입니다. 이러한 우수한 제품을 경쟁력 있게 공급하는 것을 목표로 하고 있습니다. 중량물을 안전하게 다루기 위해선 어디든지 서도제품이 필요로 할 것입니다. 서도는 귀사와 귀하의 안전한 작업을 위해 최고의 로프, 체인, 샤클, 부속품 등 용도에 적합한 제품을 경쟁력있게 공급 하는 것을 목표로 최선을 다하겠습니다. 안전을 위해 서도의 제품을 사용하시기 바랍니다.